The completion of the Unitary Plan has been one of the biggest and most important discussions Auckland has had for the last few years. The plan sets the rules by which Auckland can develop and previous planning rules were far too restrictive, especially in relation to allowing for urban development. Since it was first discussed in 2012, council in responding to groups like Auckland 2040 had wound back many aspects of the plan. It was better than what we have but not as good as it should have been. 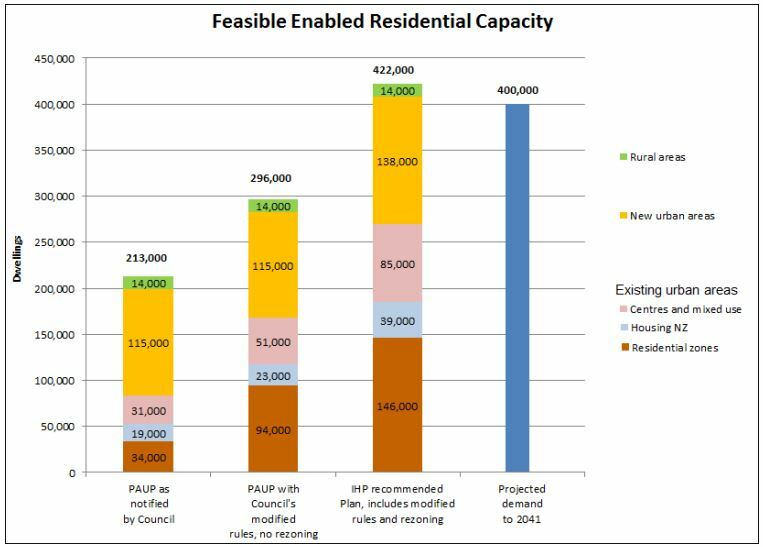 In July, the IHP released their recommendations which significantly increased what they called Feasible Enabled Capacity. In August the council accepted almost all of the recommendations from the IHP. Interestingly the opposition groups seemed to just melt away and not much was heard of them during this time. This was a huge achievement and something that looked unlikely even six months earlier. The process isn’t fully over yet though, there are still some appeals to be worked through and one of those from the Character Coalition caused a major snag. It was so broad in scope the council couldn’t make the plan operative. The appeal was later reworded to focus on character housing not all residential zoning. A important discussion this year was a project called Transport for Future Urban Growth (TFUG). 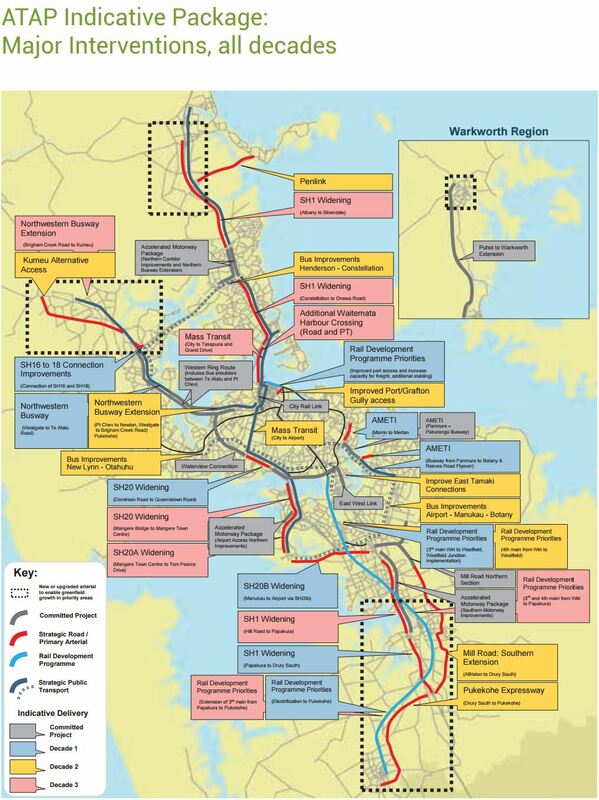 This was Auckland Transport and the NZTA looking at what big pieces of infrastructure were needed to support all the greenfield growth areas identified in the Unitary Plan. This is mostly a lot of big arterials and expanded state highways but there is some PT in the mix too. All up it is likely to cost at least $10 billion for the infrastructure planned, about $200,000 per new dwelling it enables. The final plan was released just before Christmas and I’ll cover that in the new year. I’ve already covered ATAP a bit in previous posts but in this one I wanted to point out a couple of important parts. One is that the project identified full road pricing, not just tolling a few roads, would likely be needed in coming years to help manage demand. This is important as up to that point the government had been very opposed to the mere suggestion of this. They still aren’t fully supporting it and there is a lot of work that needs to happen before we’ll see anything like road pricing introduced but if feels like the idea is now firmly in the discussion and likely to be a key discussion in coming years. In October we had local body elections and Len Brown wasn’t standing again meaning we would definitely be getting a new mayor. Phil Goff, who officially announced he was running in late 2015m, had been the front runner for a long time and in the end won by a considerable margin. In November he released his first rates proposal, something that will be a key discussion in the first half of next year. While capping rates increases at 2.5%, he also sought to look at other ways of funding Auckland’s growth such as introducing visitor levy, a targeted rate on areas to be developed to help pay for the new infrastructure those areas and raising the topic of regional fuel taxes. Goff campaigned on making the Council Controlled Organisations more accountable and just a few weeks ago we saw the draft letters of expectation to the CCOs. We covered the letter to AT which was fantastic, effectively calling out AT on issues like ignoring the councils City Centre Master Plan with their stupid plans for key streets after the CRL is completed. It also asked AT to focus on some other key areas too, such as “aggressively pursuing strong growth in public transport use and active modes” and improving speeds on the rail network from shorter dwell times. It will be interesting to see how AT respond. We’ve had another fantastic year on the blog and it’s great to see many new people starting to read and join in the conversation. Here are couple of stats for you. We’ve had around 32,400 comments and the most commented on post, with 385 comments, was Light Rail Preferred to Airport – it’s also our most commented on post ever. Many people read the blog from the homepage so it’s hard to give an accurate idea of exactly what the most read post is but here is a list of the top 10 posts from this year that people clicked through to (the top two were both April Fools posts). Many are the same as the most commented ones. Is Penlink about to be approved? Remember the last time house prices crashed 40%? According to Google analytics, this year we’ve around 300,000 unique user, over 1 million sessions and around 1.8 million page views. As you would expect, NZ is the largest source of our visitors with 82% based here. Delving deeper, 64% of all views come from Auckland, which is no surprise given Auckland is our focus. Thank you to all who have read the blog and helped support us. That is quite an industry NZTA have got going there. Projects developed for decades ahead. Waitakere is ending the year with a bang – an unexpected doubling of services between Christmas and January 3rd, because AT forgot trains don’t run to Waitakere anymore and have scheduled rail replacement buses for every run of the 139 bus which already replaced the trains. Matt, did you guys cover Kiwirail’s crazy decision to pull electric freighters off the NIMT? I don’t get why they couldn’t/aren’t going to buy diesel-electric mixed engines which used the overhead lines where they exist and revert to diesel otherwise. Probably because apart from the likely cost, it would be difficult to build a viable hybrid electric – diesel locomotive within KiwiRail’s relatively low maximum axleload limits (18 – 20 tonnes per axle compared to at least 22 to 25 tonnes per axle for most overseas railways. Not sure why I bothered. Thanks both. I must have missed your reply on that other thread MFD – thanks for the link. I hadn’t realised the weight limits were such an issue. Is that because of the standard the railways are built to? Or due to the gauge? Still seems to be a retrograde step to me. 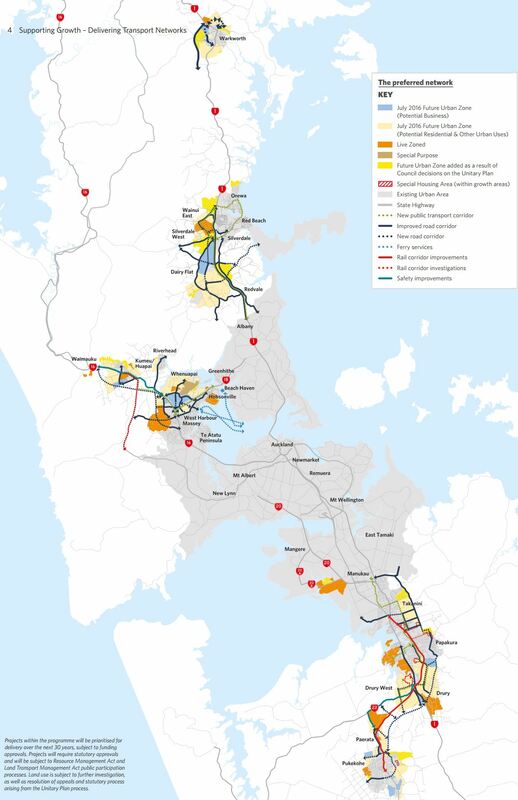 Hopefully the Nats get kicked out and the new govt will electrify Papakura-Hamilton & Hamilton to Tauranga so we can enjoy a low carbon core freight network. Or at least stop hamstringing Kiwirail at every turn. I doubt it would make financial sense, probably 500 million or more. Better things to spend that on. Axle loads are a fundamental parameter of the track (and associated bridges etc) design. Freight locomotives are typically designed to the maximum permitted axle load as this determines the force that they can apply to a train. Most of the Kiwirail network has a maximum axle load of 18 tonnes but there are a few areas where 20 tonnes is permitted. In North America axle loads of 30 tonnes are common. I have written this before on this blog but I will write it again; changing mode from road to diesel-hauled rail is far more effective in reducing GHGs than changing from diesel-hauled rail to electric-hauled rail. Kiwirail needs to compete for business by offering good service and low rates. How is further electrification going to achieve either of these? Exactly, but the point seems to be lost on most people. The Greens in particular have actually gone so far as to conduct a campaign against using rail most efficiently, which is absolutely counter-productive to their own stated environmental goals. I would argue that KiwiRail’s decision is more environmentally friendly than maintaining the status qo. Changing mode from road to diesel hauled rail certainly makes sense BUT the public perception of KR’s mothballing the NIMT electric network, disposing of the EF locos and buying more DLs, will appear to be crazy when considering environment issues, fuel costs and the general view of swapping clean efficient electric traction for dirty noisy diesels. That’s the thing; it isn’t a network. It isn’t even the entirety of a route. As for it being an election issue – not likely in my opinion. The scandal is the magnitude of subsidies and special treatment that road transport gets. Can you give us some facts to support your opinion that there are magnitude of subsidies and special treatment that road transport get? This opinion is often repeated but never backed by facts, readily available LTSA figures don’t agree with this opinion. The only special treatment given to road transport is by the owners of the freight that is transported that prefer it is transported quickly rather than cheaply. Local roads are funded ca. 50% by rates (see references below). It follows, therefore that RUCs, fuel taxes etc. do not cover the costs imposed and ratepayers pick it up. MOT has recently made claims regarding the proportion of FAR that comes from heavy vehicle RUCs but these claims are arbritrary and unsupported by data. They are essentially propaganda. revenue as a deduction from the non-use related costs in the CAM. Yes local roads are half funded by rates and rightly so, they are access roads for local properties (rate paying properties).Yes local roads do make a a huge percentage of actual road kms but when converted to lane kms and km traveled that percentage drops quite considerably. The freight industry uses local roads to deliver/ collect freight from the local rate paying properties. Rates also fund up to 80% of some public transport trips. What is the equivalent of local roads when freight is being moved by rail, sea or air? Quick answer those same local roads that are used when it is moved by the national SH network that is fully funded by RUCs with some left over for other things like PT so there are no magnitude of subsidies and special treatment for road transport. There’s no benefit to hybrid locomotives, as their use still requires the overhead, and it’s that duplication of infrastructure that is one of the unecessary costs being eliminated n their decision. It isn’t any different from simply retaining the electrics or replacing them with new ones in that respect. There is benefit in hybrid (aka bimode) locos and trains, in that they do reduce diesel consumption and hence carbon emissions and the need to change traction, which is why they’re becoming increasingly widespread for passenger trains. And “unnecessary cost [of “duplicated”] infrastructure” = “benefits of useful infrastructure”, if you have a different world view. But hybrid heavy-freight diesels don’t exist (to the best of my knowledge), so any discussion with respect to the NIMT is academic. Given that slightly over half of VKT in NZ is on local roads and given that about 50% of local road costs are met by fuel taxes and RUCs I suggest a 33% increase in these charges with the increment going to local authorities to use for PT projects or rate reductions. That would put Kiwirail in a more competitive situation and my rates would not be used to reseal the local roads that are being hammered by trucks. As for GHGs; I really have no idea what the goverment’s plan is for reduction thereof. Is there one? Matt you said in relation to TFUG “All up it is likely to cost at least $10 billion for the infrastructure planned, about $200,000 per new dwelling it enables”. This is fascinating to me, compared to the cost of increasing the density in existing suburban as well as urban areas – which I would have thought was radically less.